The park is a logical continuation of the previous park and was built in 1953 on an area of 3,380m2. 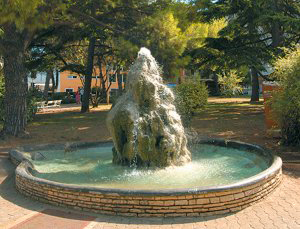 In 1960 a fountain made of Istrian stone was built as a symbol of potable water supply to Pula from the source in the Raša valley. The park has yet another peculiarity. It is the octagonal Roman mausoleum from the 1st century built at the site of the Roman necropolis. Shrubs of tamarisk, oleander and spirea are a magnificent floral sight inviting to pleasure, while the gracious bell-like white yucca flowers on a long stem “break” the grayness of the chilly autumn days. Beautiful floral groups of annuals of decorative sage, marigold and ageratum bloom every summer in all rainbow colors, and in early spring the spectrum of pansy and daisy colors brings life into the gray and green shrubs of lavender and santolina. The entire park is presently dominated by the beautiful Atlas cedar (Cedrus atlantica glauca) with bluish needles of extremely regular crown and trunk.